A bit pricy(when it comes to food and shuttles), but a wonderful hostel to stay at! Nice and calm, with a great family atmosphere, I'd love to come back! Personal is really nice and flexible, hands down. There is no WiFi, interesting policy but I would have liked it to be there. Moreover, the food is lovely. Food was great, not that many gluten free options. It's sort of an English speaking enclave. They do offer a lot of opportunities to get involved in the community. 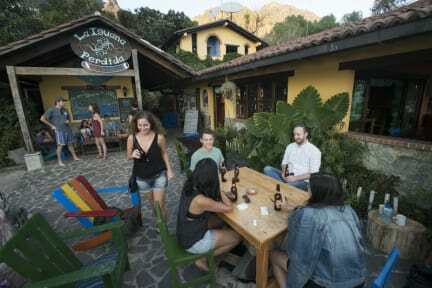 Depends on what kind of Lago Atitlan experience you are looking for. It's a cool spot but not my style so I probably won't return. Very beautiful and calm hostel by the lake. La vista que tiene es lo mejor del lugar. El hostal es un lugar para relajarse. En lo que deberían mejorar es en la limpieza y mantenimiento de los cuartos y baños. Muy sucio, toallas minis, no hicieron el cuarto y las camas el primer día de 3 que estuvimos! Excelente ubicación para poder admirar los volcanes. Pero el personal no hablaba nada de español lo cual es una falta de respeto para los viajeros hispanos, además de las habitaciones privadas demasiado pequeñas y sin ninguna limpieza. The basic room means no WALLS, no ligth, no plugs... if you want to have walls or any other confort you need to pay extra, even to leave your baggage for some hours in the reception when you leave, quite tricky... They cannot speak spanish and the atmostphere does not match Guatemala at all if that is what you want to have. Tips are asked for the "ladies" who clean and cook in the place, which in my opinion is quite embarrasing about them and should think in paying fair to these people insted.